Youth from Hopatcong, Teegan Dougherty and Aubrey McCarrick. Photo courtesy of the Center for Prevention and Counseling. 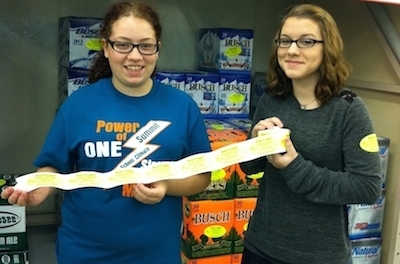 BYRAM, NJ – On Thursday, November 6th Community Trials Intervention Youth Leaders participated in a Sticker Shock Campaign at Shoprite Liquors in Byram. 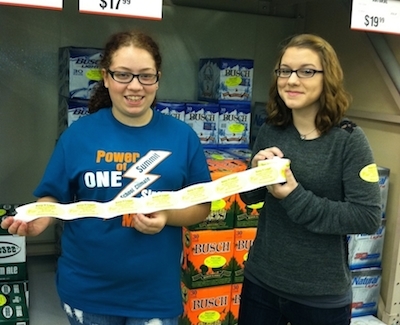 Over 1,000 stickers displaying the legal consequences of purchasing and providing alcohol to minors were placed on packaged goods in an effort to reduce underage youth access to alcohol. Stickers were placed on boxes of multi-packs of beer, wine and other alcoholic beverages. The Sticker Shock Campaign brings attention to the consequences of underage drinking in a manner that involves youth, customers and business owners. It is an initiative that not only educates the community regarding underage drinking but also enhances leadership traits and advocacy skills within the youth participating in the program.